Rod Stucker, owner of RM Enterprises in Idaho, was selected as the winner of the Envelope Technologies Campaign as part of Oak Ridge National Laboratory’s (ORNL) Buildings Crowdsourcing Community Campaign. Stucker was chosen by more than 300 students, designers and small businesses that voted and commented on the crowdsourcing event’s three campaigns, according to a statement from the lab. The announcement was made during ORNL’s Industry Day, which was held Sept. 24 in Oak Ridge, TN. Stucker’s idea is to change the way high performance expanded polysterene (EPS) foam window frames and insulated glass are installed at job sites. His concept would reduce the risk of improper installation and ensure that the energy-saving window package is tight and well-insulated. 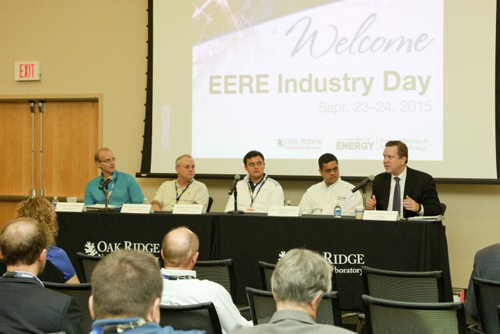 James White, Rod Stucker and James Rowland joined GE Appliance’s Venkat Venkatakrishnan and DOE Assistant Secretary David Danielson for a panel discussion at EERE Industry Day at ORNL. The other winners were Jim White, a senior energy conservation engineer at Chelan County Public Utility District in Washington State, who won in the Sensors and Controls Campaign; and James Rowland, Mark Walter and Mathew O’Kelley—from Columbus, OH—who won the Equipment & Appliances Campaign. White created a design for variable air volume (VAV) mixing boxes while the group from Ohio created a concept for a hybrid air-water conditioner, according to the lab’s statement. As previously reported, the lab launched the crowdsourcing platform in March to give innovators the chance to present ideas for new technologies for energy efficient buildings. The goal, the lab said, was to bridge the gap between innovation and the marketplace. “We’ve reached out for new ideas—not telling, but listening to innovators who can play a pivotal role in R&D of energy-efficient technologies that reduce energy costs for our homes and other buildings,” said Melissa Voss Lapsa, ORNL’s group leader for whole-building and community integration. Following on the heels of the campaign’s success, the Department of Energy has created a second crowdsourcing campaign called JUMP. The new campaign—which stands for Join in Discussion, Unveil innovation, Motivate transformation, and Promote technology to market—will provide cash awards between $3,000 and $5,000 for winning ideas. The lab also said it provide in-kind technical support for the validation, testing and prototyping of the campaign’s winning ideas. “With JUMP, ORNL is engaging directly with industry partners, developing crowdsourcing campaigns to address pressing industry challenges and accelerate the next generation of energy efficient building technologies,” Lapsa said in the statement.